Dr. Lynn Utchell began her educational career in 2004 as Hopewell Area School District’s first School Psychologist Intern. Following her internship she worked as a School Psychologist in Allegheny County for the Shadyside Academy Junior School and the Carlynton School District. Dr. Utchell proudly returned to the Hopewell Area School District in August of 2010 as the Director of Special Education. Prior to beginning her career, Dr. Utchell earned a Bachelor of Science in Psychology from Allegheny College and obtained both her Master of Science in Education and Doctorate in School Psychology from Duquesne University. Her educational focus has centered on the areas literacy and inclusion. 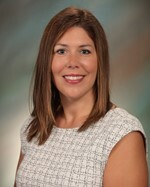 She is a member of Pennsylvania and National Associations of Pupil Services Administrators, National Association of School Psychologists, Association for Supervision and Curriculum Development and the Beaver County Local Task Force. Outside of school she enjoys spending time with her husband, two children and golden retriever. Dr. Utchell is dedicated to making sure ALL individuals find their purpose, passion and pride at Hopewell!